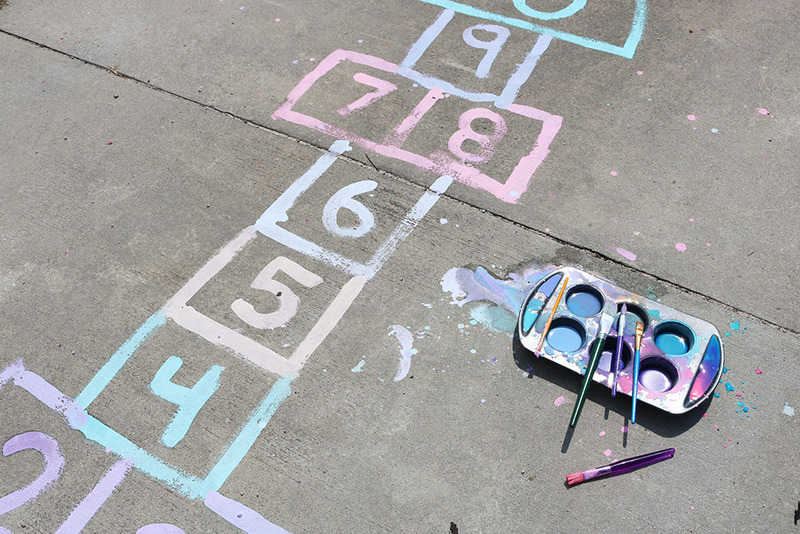 Learn how to make DIY sidewalk paint chalk that will keep your children entertained for hours! This quick and easy kids craft activity is a perfect way to get kids outdoors! 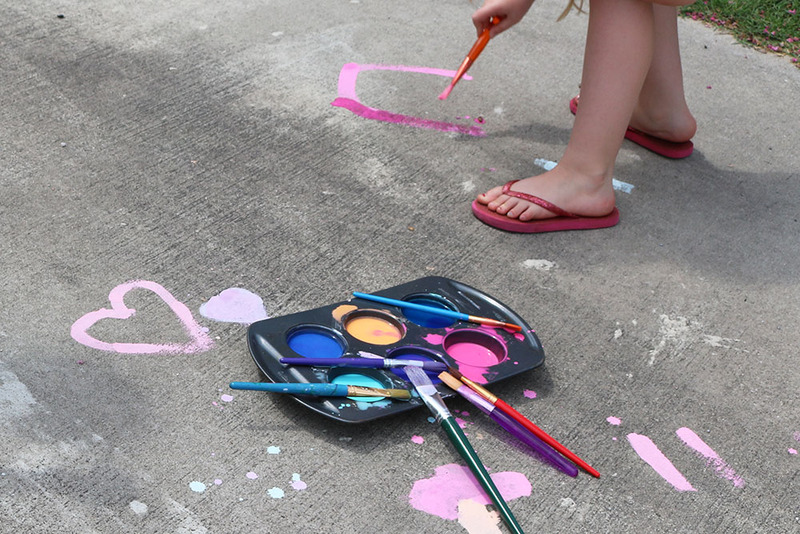 DIY sidewalk paint chalk is a favorite outdoor summer activity of ours! We recently shared our favorite DIY Puffy Paint for Kids recipe and it was such a hit with our readers and friends so we knew we had to post this super fun activity before summer is over! 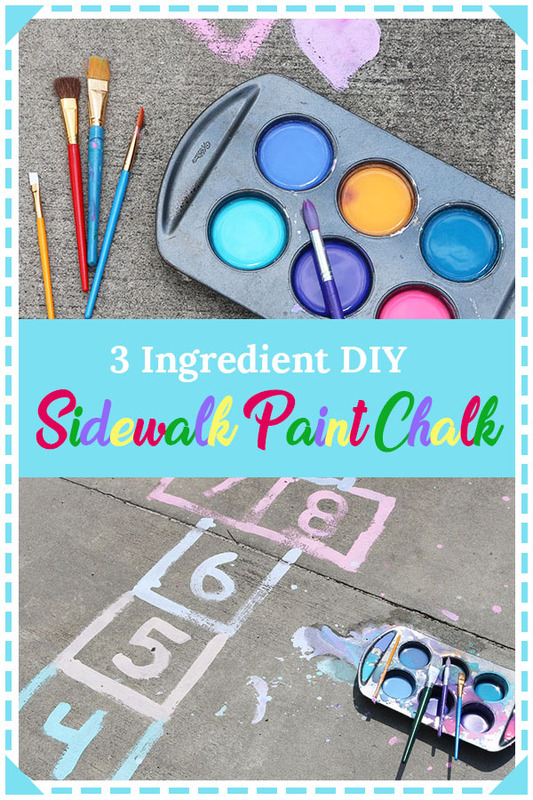 Making your own sidewalk paint chalk is really easy and you only need a few ingredients that you probably already have on hand! Mix together the water and cornstarch, and stir until the cornstarch dissolves. Once mixed, divide the mixture into cups or a painting tray. A muffin tin works perfect for this and is what we use. This recipe divides perfectly between the 6 sections of a muffin tin. Then add different food colors to each section to get the colors desired. The colors will dry much lighter on the sidewalk than they appear in the tin. 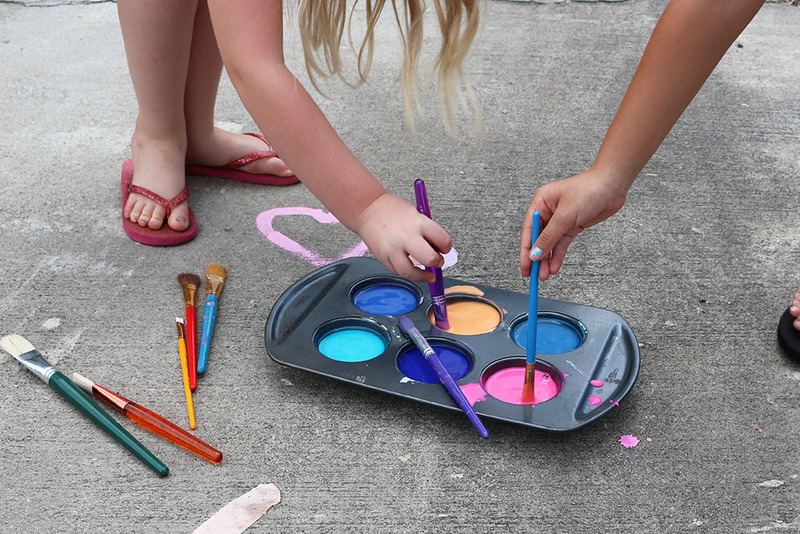 Larger size paint brushes work the best for this sidewalk paint chalk. A little bit of this paint goes a long way! Abigail had a friend over and they painted for over an hour and there was still paint left when they were done. Even after spilling some and drawing a large hopscotch to play on! With all the technology that has made it’s way into our home, I love doing projects like this that continue to spark creativity in the kids. Don’t get me wrong, we are definitely not anti-technology, I just love incorporating some nostalgic activities like a good ole fashion hopscotch and outdoor fun into their lives as well. After all, balance is what it’s all about, right? Does this Sidewalk Paint Chalk Stain? You are probably wondering if the food coloring causes this paint to stain. While I can’t speak for every surface or food colors, our did not stain. It washed off our hands easily and the sidewalk paint washed away completely as soon as it rained. We have made this recipe multiple times using different food coloring brands and it has always washed away easily. If you are worried, you may want to make a small amount and test it on your sidewalk before letting the kids go crazy with it. 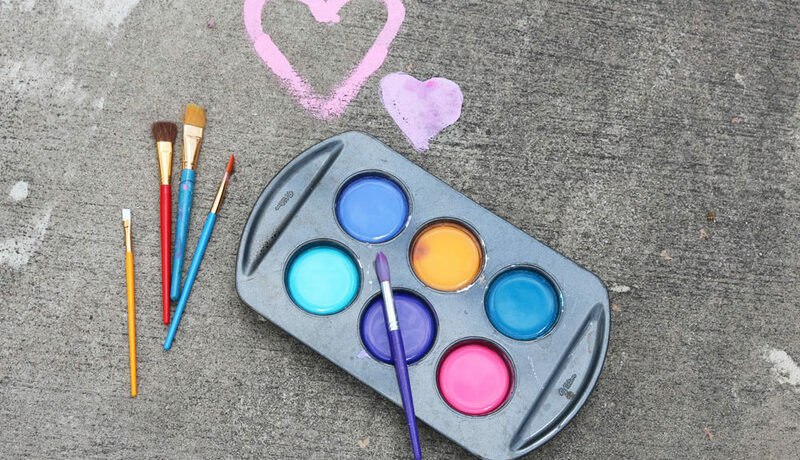 If you love this DIY sidewalk paint chalk, make sure to pin it so you can do this at home with your kids! Next Article Next post: First Day of School Printable Sign – All Grades! Looks like so much fun. My kids rarely play with chalk anymore but I loved it when they were younger. This is such a great idea and only 3 easy ingredients! My daughter is 12 but likes to use sidewalk chalk to write things to include when she is on electronics. Lol. So this is great! 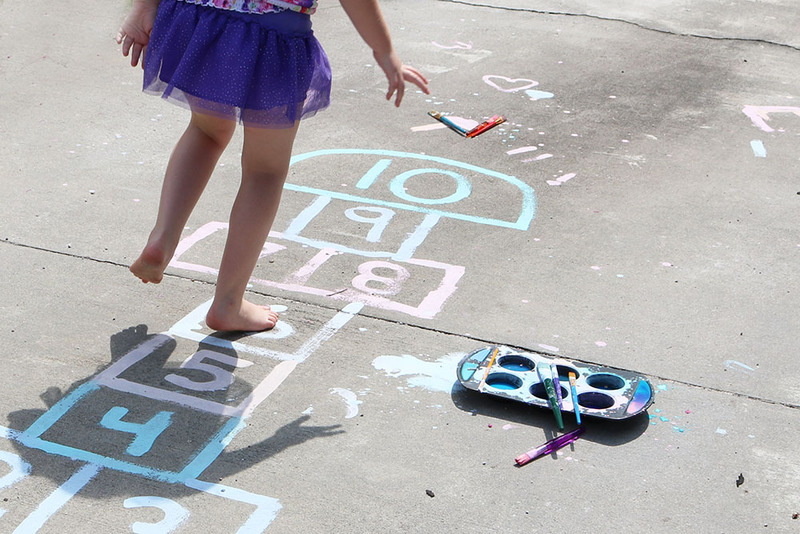 Gotta love hopscotch and it’s a great DIY! Great tip on the muffin pan as well. This is great idea, more fun than the chalk! This is so cool. I will have to do this with my toddler once it cools down some. This is one of our favorite activities as well! Looks like fun! The kids love sidewalk chalk! We’ll have to try this. This looks like such a fun idea. OMG! My daughter loves chalk and coloring our driveway. She also loves painting. This is a great way to combine both and we can make it with what we have at home. Such a great idea. Thanks for the recipe! this is such a cool idea. I would have loved to do something like that when I was younger!!! So perfect for the summer! I have all these ingredients right now! I’ve been looking for things to do with my toddler, and this is perfect! Simple and fun! I can’t wait to try it out! Sidewalk chalk is always so much fun! Yours looks like it turned out great! Really love this activity. Def gonna try with my kids. Such a fun idea! 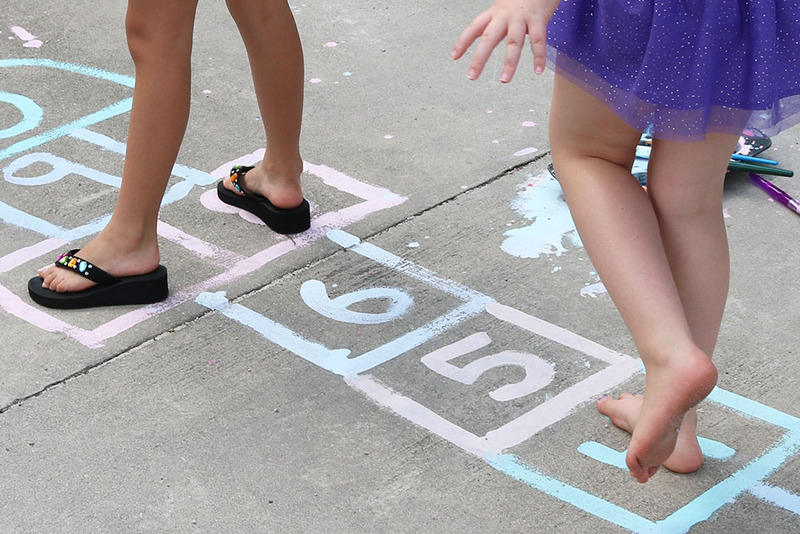 Hopscotch is such a great activity. Love this alternative to chalk! Talk about simple and fun!!! What a great idea and – only three ingredients?? Sweet! I love this idea!! My boys would love this and I know they would enjoy helping me make it as well!! This looks like such a fun way to spend a summer morning. I was surprised at how simple it is to make this. I will have to try it with my grandkids. So cool! My kids would love this and a great way to keep them busy. thanks! This is such an easy and fun activity! I am totally going to do this with my kids – they will love it! My son would love this idea! It’s his favorite things all in one: being outside, chalk, and paint! oh my goddess I absolutely will buy cornstarch today and do this! I love love love it! I always spend so much money on sidewalk paint!